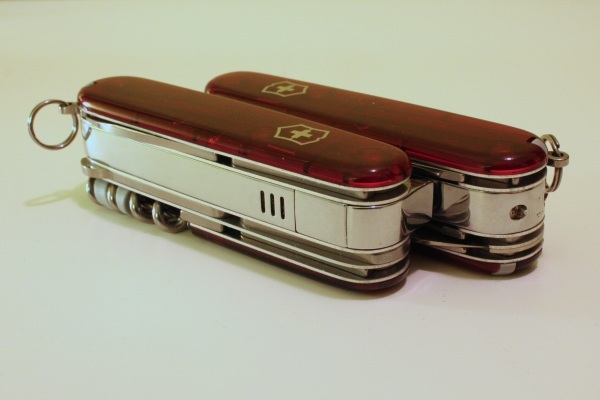 These are a couple of unusual Victorinox SAKs. The SwissFlame adds a butane gas lighter to the Climber model, while the CampFlame adds the lighter and a small screwdriver to the Camper model. The SwissFlame and Campflame have been manufactured for only a couple of years (from 2002 until 2005). They were never for sale in the United States, since the lighter was considered unsafe: it requires only a single action to start the lighter. The SwissFlame and CampFlame are considered very rare, while they are actually pretty new models. I found the CampFlame and one SwissFlame in a store in Utrecht, where they had probably been on display for at least five years. The other SwissFlames were on sale in Amersfoort. One of them is missing the manual and the inner box, unfortunately. Do you have any of them for sale? Yes, 2 of the SwissFlames are for sale (http://www.vicfan.com/for-sale/). Not anymore… sold a long time ago. if you sale one i am intrested, can i contact you ? I have none for sale. When I do, they will probably end up on eBay (just sold a CampFlame for $152). I have a CampFlame I’d like to sell, what is the going collector’s rate for one of these? Those are even more uncommon than the SwissFlame. I’m not sure about its value though. I do know I would never sell mine for less than appr. $100. I have a swissflame in its box for sale. I am interested is it new? Ho wmuch ?